One of Leica Q’s best benefits is its dual-focus system: auto and manual—the latter of which uses a mechanism similar to the German camera maker’s pricey rangefinders. There is a dedicated focus ring and adjustment knob around the lens, which when activated, cause the electronic viewfinder to magnify the shooting subject and present visual cue—green “peaking“—when in focus. This feature is particularly handy because: the lens is wide-angle (28mm); the f/1.7 Summilux glass and 24-megapixel full-frame sensor capture so much detail that cropping-in can replace a telephoto; but when shooting wide, with multiple objects, the auto-focus system can hone in on the wrong one. On May 28, 2017, as I walked down Campus, midway between Meade and Monroe, I spotted a Siamese not seen before. I lay down on the sidewalk to capture the moment. 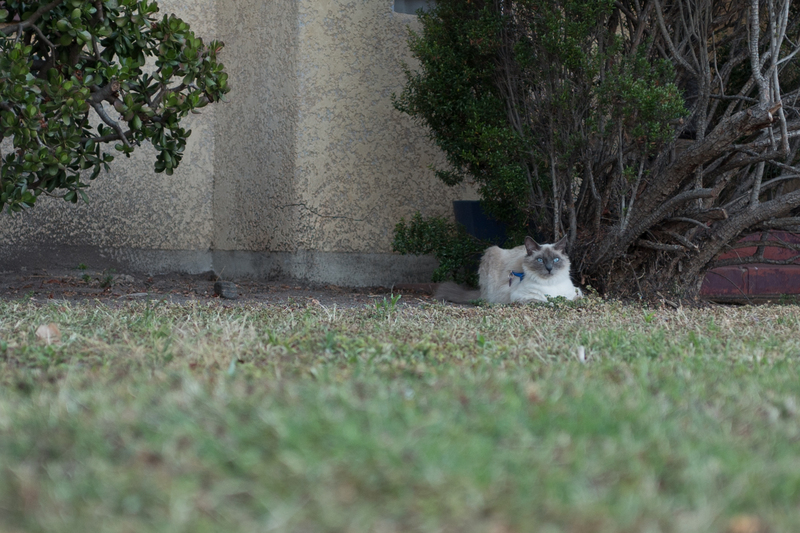 Since the kitty was so still, I took a few extra seconds to switch to manual focus. Interestingly, as dusk settled, none of the auto-focus shots were right. 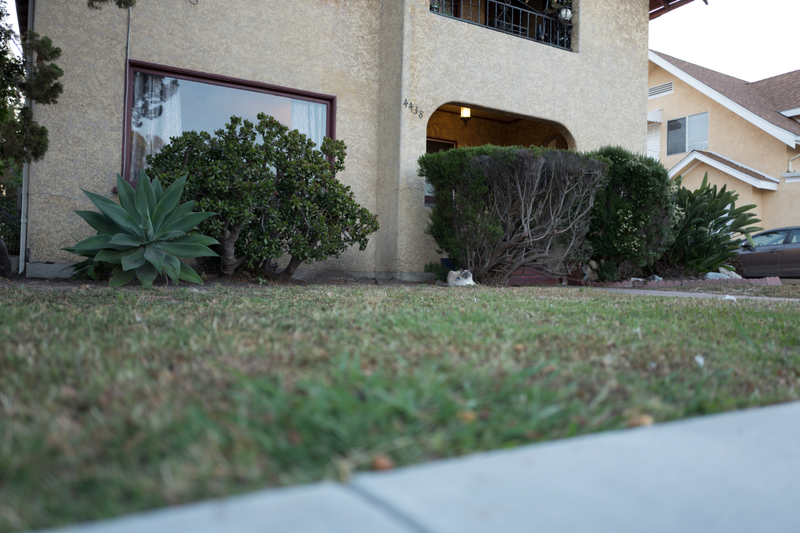 The Featured Image is spot on the cat, in this close crop. The original, which is below the fold, gives actual perspective and illustrates how much detail the Leica Q captures. Vitals: f/1.7, ISO 100, 1/250 sec, 28mm. Time: 7:12 p.m. PDT, about 40 minutes before sunset. You may also like: Scruffy, Roly Poly, Woo, Skull, Biscuit, The Colonel, White, Chipper, Frisky, Stretch, Needy, Farfisa, Mates, Hunter, Pee-Pee, Blue, Blue Too, Bonded Pair, Patience, Fess, Jumper, Frenemy, Looker, Cozy, Scout, Lurks, Skit, Mini, Betty, Black and White, Stalker, Bell, Chill, Sammy, Scratch, Poser, Star, Grey and White, Watcher, Herman, Comet, Roman, Willow, Chub, Nimbus, Watson, Lilo, Kit, Pepe, Twilight, Sebastian, Spot, Booger, Ash, Veruca, Riley, Mellow, Bonde, Flower, Glass, Black, BeBe, Fang, Bruce, Siamese, Pounce, Tortie, Haiku, Fraidy, Peso, and Daniel Tiger.